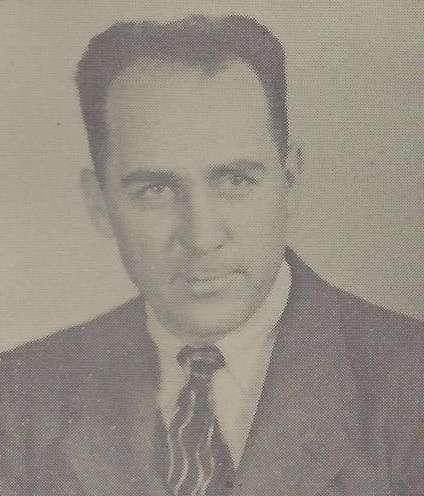 Clayborne Deaton Campbell was born on April 13, 1911, son of Horace and Bertha Deaton Campbell of Deputy, Indiana. 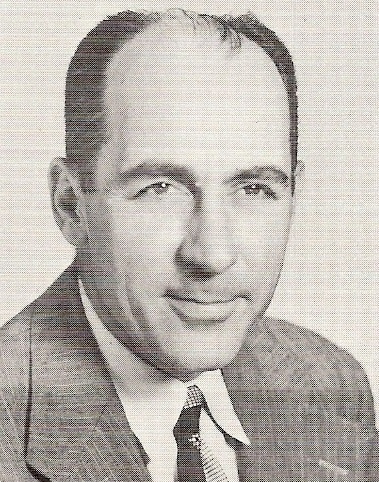 He graduated from Witherspoon High School and he then went on to graduated from Berea College in 1938, with an A.B. degree in education and a B.S. in Agriculture. Then on to West Virginia University where he received his masters degree. On September 3, 1940, he married Virginia Callison of Beard, Pocahontas County, West Virginia, who was also a graduate of Berea College. Clayborne Campbell joined the Navy and served during World War II. He enlisted in the Navy as a non-commissioned officer in the then-now field of radar and electronics. Following training in Pennsylvania, he was stationed in Corpus Christi, Texas, where the family lived for three years. To this marriage was born two daughters; Helen Campbell Graves (married to Rodney Graves) and Ruth Campbell Sturgill (married to William Sturgill). Mr. Campbell came to Union High School as a teacher in the Vocational Agriculture and Science departments and Advisor to the Union Chapter Future Farmers of America program and remained a teacher at Union High School for thirty years. He was a role model for all the young men who studied under him. Mr. Campbell taught every student on an individual bases. This was before the new so called “Special Education”. We were all special to him regardless of how much money our family’s had or what their standing was in the community. We were all equal. He seemed to have an ability to determine most student’s strengths and weaknesses and helped them to develop their strengths. He was an encourager. He told his students “You can do it …whatever it may be.” He gave his students confidence in themselves and encouraged them to reach for the stars. By: David Sizemore, UHS Class of 1961, Future Farmers of America “Star Farmer” and President of the FFA for the 1961 year. I had Mr. Campbell as a teacher for Vo-Ag, Shop and FFA Advisor my four years in high school. It was the summer of 1962, my father (Bernie Elmore) and I were working the garden when a car came down the lane and stopped at the garden. It was Clayborne Campbell. After they chatted a while, he asked Dad if he could borrow me for a few days to go to Deputy, Indiana, to pick up his mother and brother who was coming for a visit. It was agreed I could go along to help him drive. The day arrived and Mr. Campbell picked me up at the scheduled time. He drove almost to Charleston and said he was a little tired after crossing the mountain and asked if I would drive for a while. I had no idea that Charleston was that close but he navigated me through the city and a little later he took the wheel again and drove almost to Cincinnati, where he got tired again, and his reason was that he couldn’t drive and navigate at the same time. Now being a country boy that had been driving for some time and never had to take Drivers Education from him (he was the Drivers Education Instructor), I guess he thought I needed a lesson in reading road signs and driving in the big cities. Was he right? Of course, being that Lewisburg was my biggest town, up to that point. Now I can’t remember how many nights we spent in motels before getting there, maybe none. I do remember it was late that night we arrived and we left the next morning, coming back a different route… I guess so I wouldn’t have a chance to remember the cities I had driven through, plus this would add to my driving experience. I can remember driving through Huntington and Charleston. The point is….he was very clever and always had a lesson in most things he did or said. I also remember a day in AG class someone asked him a question. He gave an answer that was a little bit unbelievable and someone questioned him on his answer. He replied, “Do you have the AUDACITY to doubt my VERACITY to INSINUATE that I am PREVARICATING”. He would not tell the class the meaning of the words. I went to the library and looked up the four words and they did, in fact, exist! I learned the meaning of the words and have remembered them to this day. 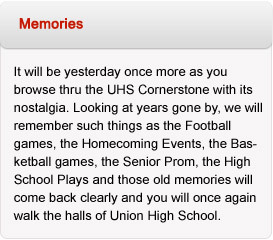 By: John Elmore, UHS Class of 1963. Future Farmers of America “Star Farmer” for the 1963 year. Dale Beckett, Union High School-Class of 1959, became Future Farmers of America “Star Farmer” in his senior year and became “All American Farmer” in October 1962, the highest degree awarded by the Future Farmers of America, through the guidance of Mr. Campbell through the Union Chapter Future Farmers of America. Clayborne and Virginia Campbell owned a Dairy farm near Union. They provided dairy calves for 4-H members to raise and show at the West Virginia State Fair. They both were involved through the years in the 4-H program. Mr. Campbell was a member and officer of the West Virginia Dairy Herd Improvement Association. He was also a charter member of the Bluegrass Ruritan Club and the West Virginia Teachers Association. He served on the Monroe County Board of Health and the Monroe County Health Center Board of Trustees for 29 years. He attended Mount Pleasant Presbyterian Church in Sinks Grove where he was a former Sunday school teacher. Clayborne Campbell died on August 3, 2000 at Greenbrier Medical Center at the age of 89.